There are some interesting political power models emerging. (Image from the video below). The trend in modern democracy is for power to become more central. The executive grows taking more and more power. It is done in the name of the “people”, the ordinary voters. Actually, is not representative of their wishes. These centralised political power models are rigid and secretive. Important decisions are increasingly taken by the executive involvement of government officials rather than by policy management. Most modern governments challenge the openness of true democratic government. The challenge often goes under the name of security or anti-terrorism. The consolidation of power in a government executive builds walls around government and separates it from the public. In turn, this leads to a largely disaffected voting base. We are all feeling powerless to change things. “But”, says the government, “things are so dangerous at the moment that we will look after you”. “New legislation”, they say, “will allow us to find out ‘this’ or ‘that’ about terrorists”. The promise is that it will help keep you safe. This is the ‘safety’ political power model. Sadly things are not what they seem. The ‘safety’ political power model is an illusion. Criminals and terrorists are great at hiding from everyone. That is how they survive. In most cases anti-terrorist, security and anti-privacy laws do not help find criminals or terror suspects. However, these laws do infringe on the free speech of ordinary citizens. Anti-terror laws increasingly are used against private citizens or take away their privacy. Yet, we see no benefit from more terror arrests than from previous laws. It is a slippery slope government slides down. Career politicians are swept up in the self-reinforcing myth that gagging laws, anti-terror laws and less privacy help protect us. It may protect political jobs. It may help control the population at large. It will not help stop terror threats. Instead it is a method of social control by gradual silencing of those who recognise the threat. The ‘safety’ political power models are actually becoming a form of modern dictatorship by government cabinets. Democracy is supposed to be a way to represent the people of a country. As democracies centralise their power they tend to perform more direct actions without going to parliament. In Europe and the USA central government now make routine management decisions rather than policy. They close hospitals, change the speed limits, tap phones, store your emails and change school structures. These and many more things can be done with no legal or independent over sight. This is not democracy. Its not the type of political power models our family members died for in the last war. World War II showed the dangers in dictatorship and loss of freedom. Democracy was a way be represent people and be open. That promise was not realised. The modern democratic state does not represent the people. In the UK we have a government who had no clear majority and can only govern by coalition. In addition the entire vote of the electorate was little more than half the total. The current political power model for the UK allows a minority government to rule unopposed with less than 40% of the votes. That is a democracy in name only. We need to re-think democracy. The Internet has for the last fifteen years provided a new focus for much of the social change in modern economies. It has given birth to new types of commerce, renewal in the arts, changed popular culture and much more. New ideas are emerging for political power models too. Popular publishing, crowd funding, mass movements against political forces are all having an impact. It is early in the life of the Internet to be talking about radical new political power models of representation. But the interest and ideas are beginning to form. 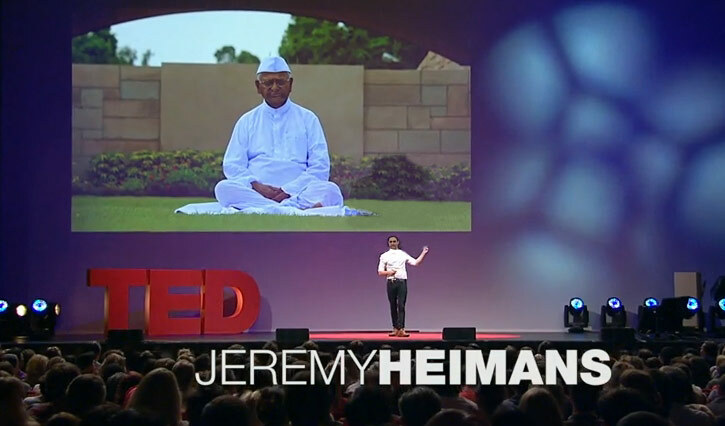 In the video, Jeremy Heimans talks about, “What new power looks like”. He has experience with mass movements of people who have agreement and commitment. He is one of the co-founders of Avaaz (an online political movement with more than 15 million members). He is also involved in a number of other online movements and campaigns. He talks about the developing new political power models and how they might work. Published online by TED. Jeremy Heimans: what new power looks like. Comments, amendments or ideas on this article? Jeremy Heimans: what new power looks like.